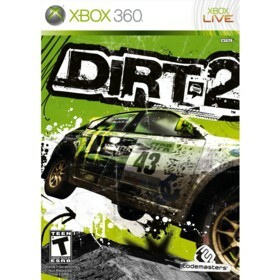 Colin McRae: Dirt 2 is a Xbox 360 game in the Driving genre. The game was published by Codemasters and developed by Codemasters. The game has an ESRB Rating of T (Teen 13+) and was released on 2009-09-08. The game's official site can be found at www.dirt2game.com. Amazing Rally/Dirt Racer by Codemasters. This is a superb game. The graphics and sound are both excellent. The gameplay is very fun...featuring a career mode that takes you around the world from Utah to Japan and everywhere in between. The events range from Rally cross events to time trials and the game also features a very robust online mode. This game also has achievements...most of which are fairly easy to attain if you complete the career mode. Overall the career mode will take you about 20-25 hours to complete and once done you can try to beat other online players via online weekly challenges or just have fun racing online with strangers. This is a great game by Codemasters featuring various racers from the pros such as the late great Colin Mcrae. The vehicle selection is also fantastic with various models to choose from including Raid, rally, Buggy and Trucks/SUVs.